Behold — one of the most extraordinary estates on Florida’s Treasure Coast. This spellbinding oceanfront paradise is situated in the charming village of Vero Beach just steps from the wave-lapped sugar sands. The brand new compound is designed for both entertaining and extravagant resort-at-home living. The 18,000-square-foot residence fronting 200+/- feet across the ocean has eight bedrooms and eight full bathrooms, plus four half baths. 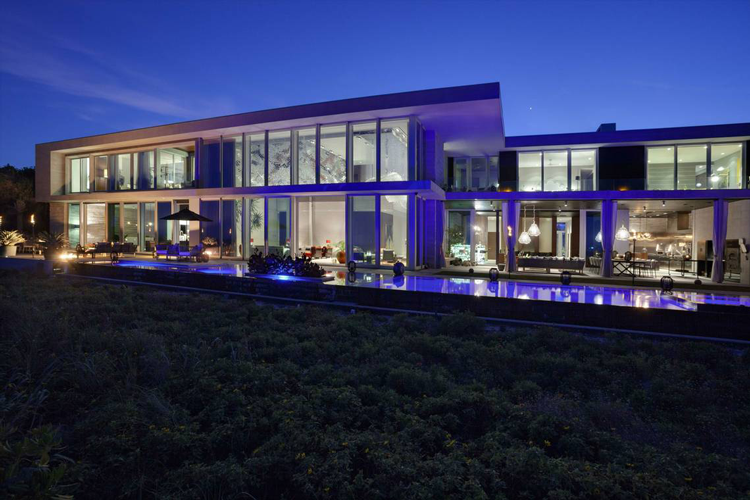 The estate connects with surrounding landscape in a seamless indoor/outdoor flow with floor-to-ceiling glass windows showcasing the property’s lush landscaping, the serene infinity pool and the expansive ocean beyond. The residence was designed by renowned architect Erik Helgen of Helgen Architects, LLC, in collaboration with Alloy. Landscape architect August Gerard Schwartz carefully designed the property’s gorgeous landscaping, and the interiors were crafted by talented designer Dorothee Junkin. This team created a stunning and timeless work of art — both inside and out. The entrance courtyard with a waterfall curtain introduces the refined interior combining contemporary elegance with international influences. The layered composition of limestone, wood, and glass in the main living space provide a unique and rich look cohesive with the rest of the residence. Towering overhead, two ethereal fiber-optic lighting installations by British designer Sharon Marston crown the lofty living room, providing spectacular artwork and practical night-time illumination. Likewise, a breathtaking 60-light Swarovski “Flying Candles” installation sets the mood in the formal dining room. This room has a romantic and intimate mood that differs from the light and vibrant feel found elsewhere in the estate. 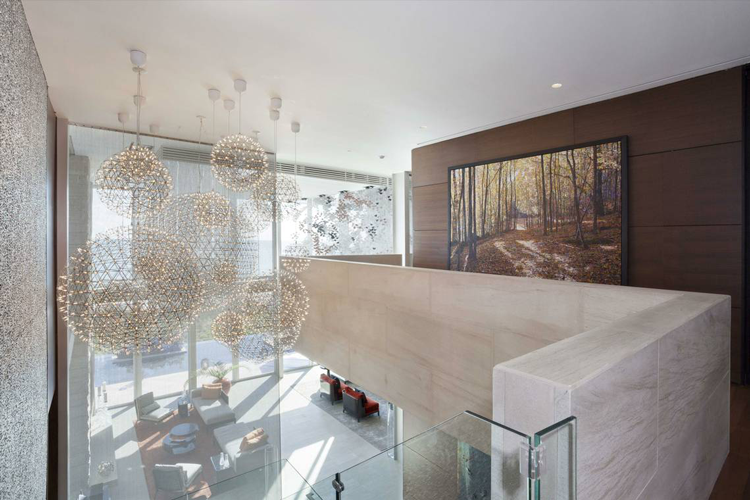 Artful finishes in the estate include Silver Shadow Alabama limestone, American walnut, exotic marble and onyx, bamboo cane, reticulated aluminum, stainless steel dutch weave mesh curtain walls, Phillip Jeffries and Wolf-Gordon wallcoverings, and bath fixtures by Dornbracht and Duravit. 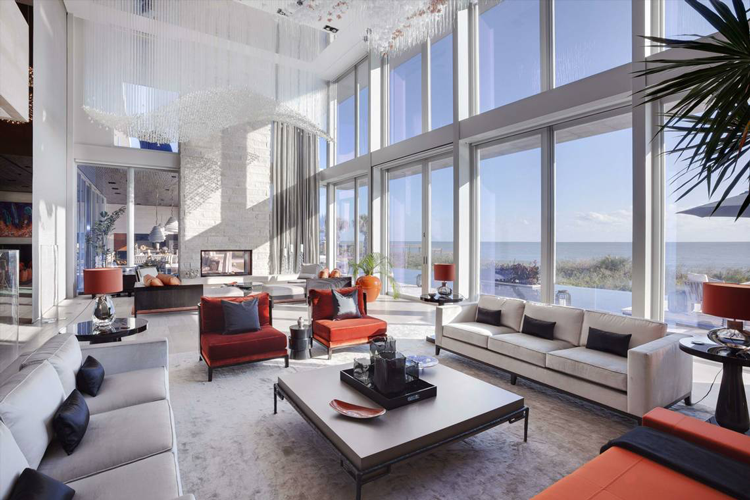 The residence features state-of-the-art technology and amenities, including the Crestron home automation for lighting, audio/video, shades, and security, in addition to a whole-house generator, an elevator and more. 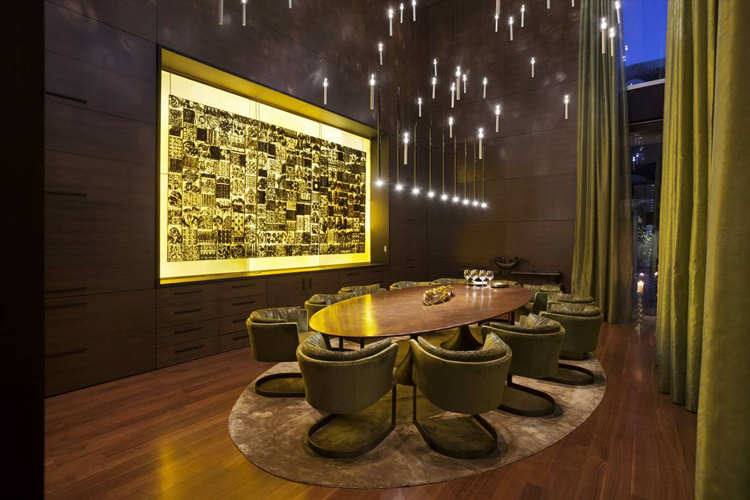 The impressive media room features a fireplace, a drop-down large-format screen, luxurious seating, and a full wet bar with backlit onyx surround. Park your vehicles in the main house double-bay garage with a motorized turntable, the double-bay porte cochere nestled between the main and guest house, or the six-bay garage located beneath the guest house. 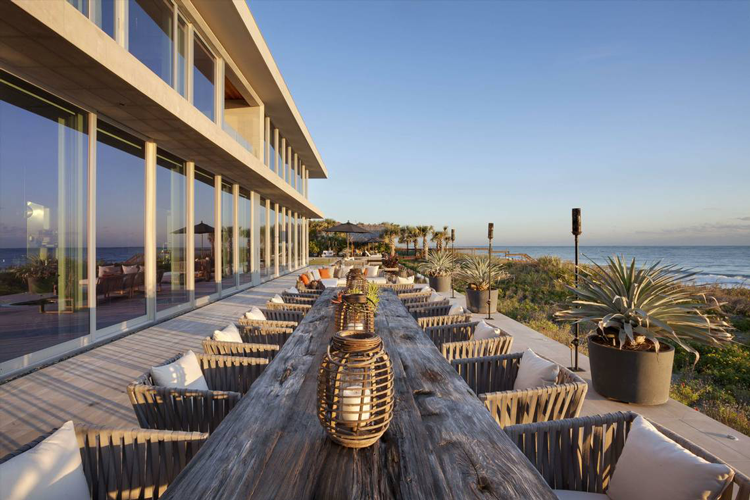 The gourmet kitchen, a casual dining room, and a family room exist in one cohesive space, offering uninterrupted views stretching from the ocean to the west pool courtyard and koi pond. The kitchen contains the highest-quality appliances by BlueStar, Wolf, Sub-Zero, and Bosch. There is also an adjacent chef’s catering kitchen and servery. 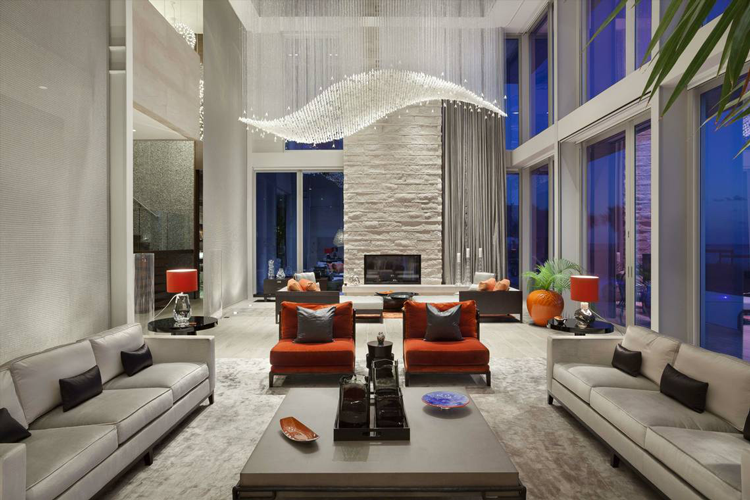 Ascend the stairs, passing by extravagant details like sparkling spherical chandeliers overhead, to the second floor. 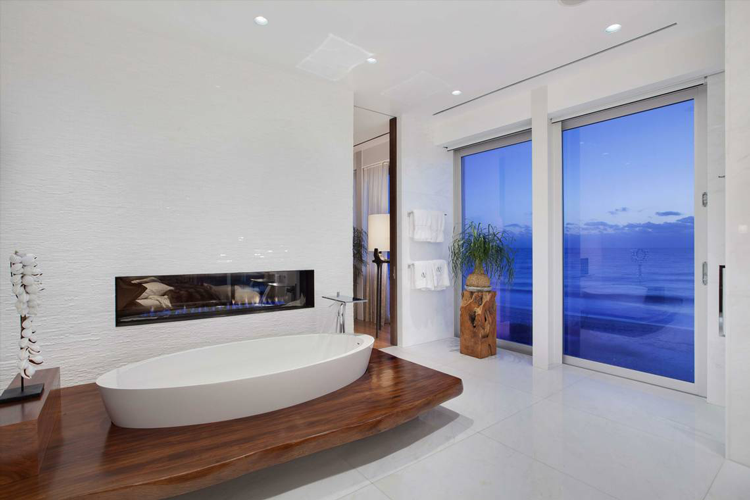 Inspiring ocean views fill the serene glass-walled master suite in a private wing opening to a balcony. A double-sided linear fireplace is shared by the master bedroom and spa-like master bathroom with a soaking tub, a steam shower, and an outdoor shower. The suite also contains a walk-through wardrobe room and a private sitting room with a fireplace and a morning bar. 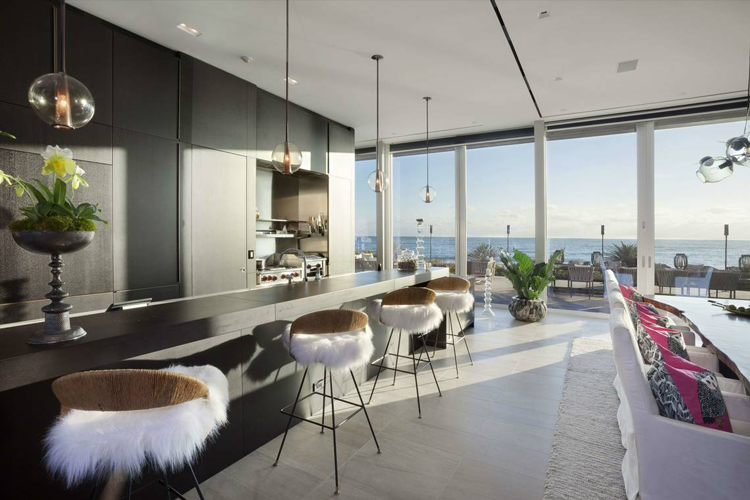 The second floor hosts two oceanfront offices with one opening to a private balcony, a fitness room/hair salon overlooking a rooftop garden, and three bedroom suites. The exterior living spaces of this residence are equally as impressive as the interior. Step through the glass doors of the downstairs living space to discover idyllic lounge areas edging the sleek infinity pool. This oceanfront lanai features an outdoor fireplace, a full summer kitchen with a wood-fired pizza oven, and plenty of space to relax, dine and gather — in both the shade and sunlight. The property also has a west pool nestled in a lush courtyard joining the main residence with the guest house. The guest residence offers ample space for hosting visitors, who can retreat to their own separate getaway. Connected to the main house via an exterior breezeway, the guest house contains a living and dining room with a kitchen, a powder room, a master suite and two upstairs bedroom suites. 3700 Ocean Drive is listed by Premier Estate Properties agents Kay Brown, Jeanine Harris, and Luke Webb. This highly accomplished team offers over 62 years of combined real estate experience and has collectively closed over $250 million in sales. As residential estate specialists for some of the most prestigious communities and ultra luxury properties in the Vero Beach market, they provide a depth of knowledge, a degree of skill, and a level of commitment that has repeatedly earned the loyalty and trust of their elite clientele. Contact Brown, Harris, and Webb for more information about this significant property!